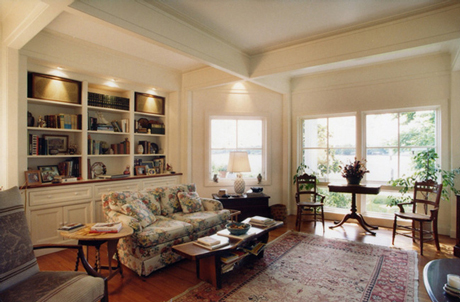 Sleeping, Sitting, Dressing and Office all enjoy the openness and views. with gentleness as we enter the bedroom suite. 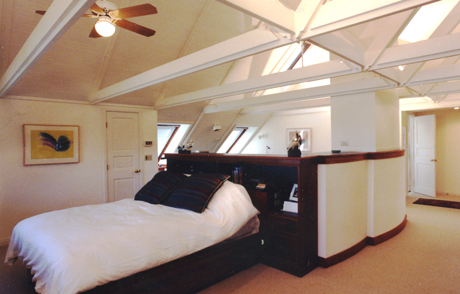 giving the bedroom an open and airy feel. Built-in cabinetry and custom furniture can dramatically enrich our experience. Both add layers of richness to almost any interior. No doubt they also add cost, both in terms of the design effort and the cabinetry budget. On the the other hand, each can address our functional needs in a way that adds beauty. Where, for example, are we going to store the stuff we don't often use, such that it doesn't become unsightly clutter. Built-ins designed to meet such needs elegantly, add joy to our daily lives as well as adding value at the point of resale. Sometimes built-ins can be used to blend additional uses into a given space - uses that would otherwise have to be boxed off in separate spaces. 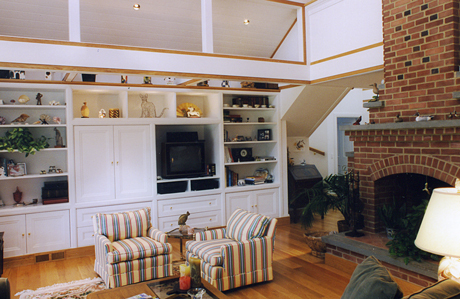 The cost of the built-ins might even be less than the cost of building extra room(s) for each of these purposes. 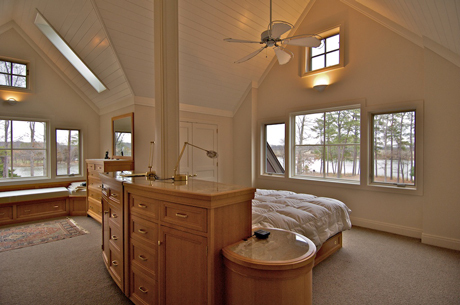 For example, at the Deep Landing - Angles house, the Master Suite (to the upper left) has a central core of custom cabinets that creates 4 separate spaces for sleeping, dressing, office, and Sitting - all without destroying the ambient light, views and airiness of what is really, a rather small space for all of that. Moreover, the cabinetry's curves, varnished details, and stony finishes enliven the master suite. 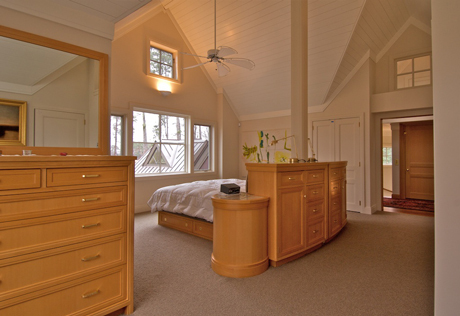 Note how the bookcases interlock with the bedside niches to provide storage without clutter, and "hide" the TV. Architect-designed cabinetry adds richness because it creates layers of architecture to address our functional needs - in other words, it creates the utility we need, within the beauty of form.